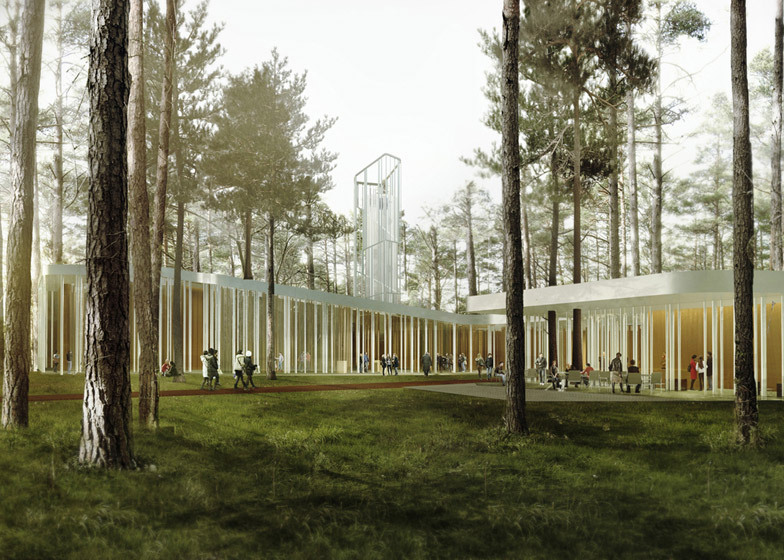 News: Spanish office Nieto Sobejano Arquitectos has won a competition to design a woodland cultural centre for the organisation run by Estonian composer Arvo Pärt, after claiming their proposal won't involve felling a single tree (+ slideshow). 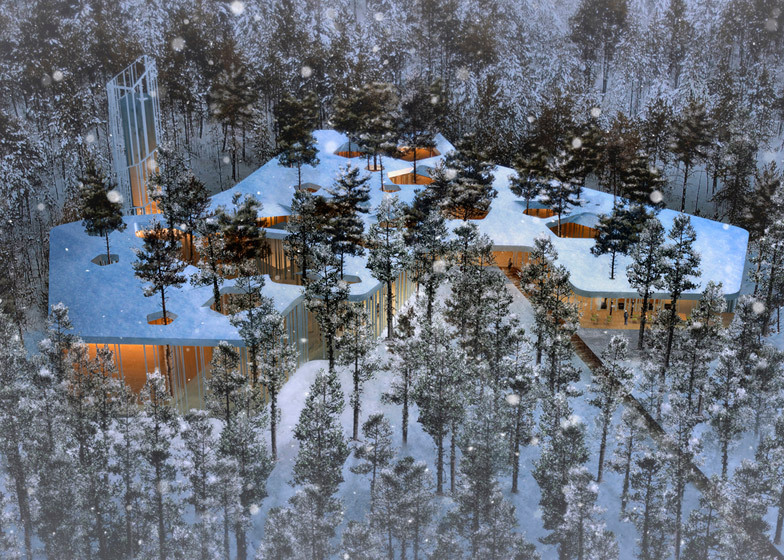 Nieto Sobejano – who has previously completed museums and galleries in Spain, Austria and Germany – was awarded first prize in the contest to design a new home for the Arvo Pärt Centre, which was founded by the composer in 2010 to preserve and promote Estonia's musical heritage. 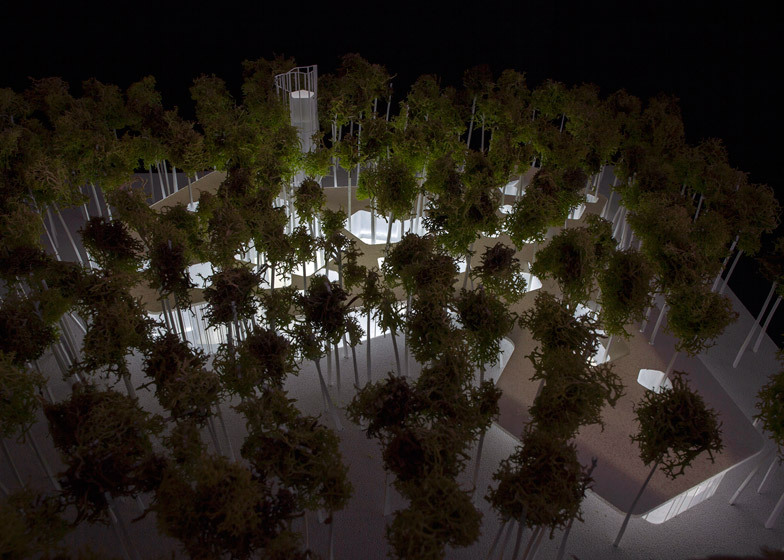 Envisioned for the woodland of Laulasmaa, west of Tallinn, the building is conceived as a pentagonal grid of spaces and courtyards that will echo the rhythms of Pärt's symphonies – without disturbing any existing pine trees. "We admire the purity of the mathematical laws through which Arvo Pärt is capable of generating powerful poetical emotions by means of the simple permutations of a limited number of sounds," explained architects Fuensanta Nieto and Enrique Sobejano. 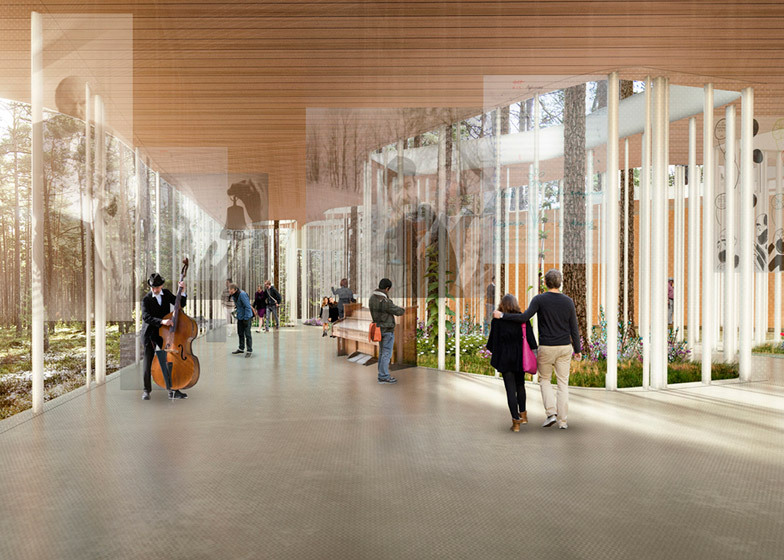 "Just like those musical structures that reflect one theme in another, we imagine the new building as a geometric pattern that will contain the existing pines in courtyards of variable dimensions." 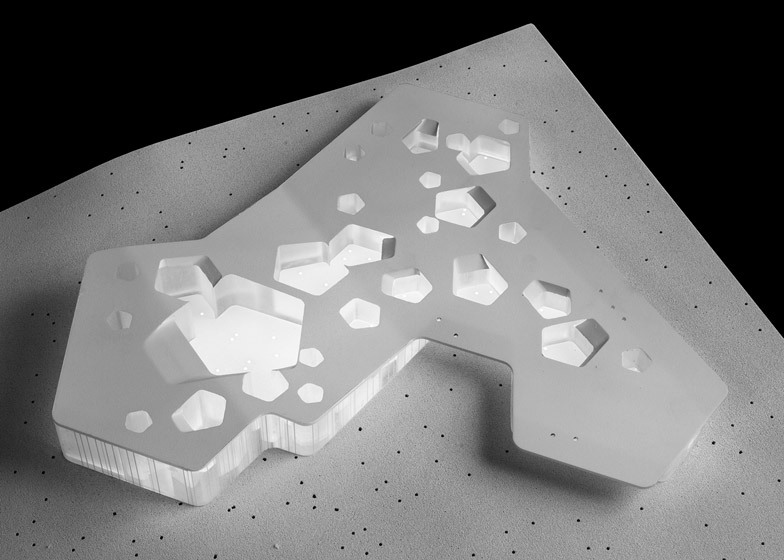 The competition, organised by the Arvo Pärt Centre and the Union of Estonian Architects, called for a building that centres around the Arvo Pärt archive, but also features an auditorium, a library, workshops and offices. Nieto Sobejano's proposal, named Tabula, features a matte-aluminium roof that rises and falls over a forest of slender columns, as well as a pentagonal observation tower offering views out toward the sea. The architects imagine the space as non-hierarchical, offering places for study and reading, as well as opportunities to watch a performance, visit an exhibition or take a stroll in the woods. "To keep alive and interpret in architectural terms the creative legacy of Arvo Pärt means to find a balance between the intimacy of his musical compositions and the powerful beauty of the Estonian landscape," they said. 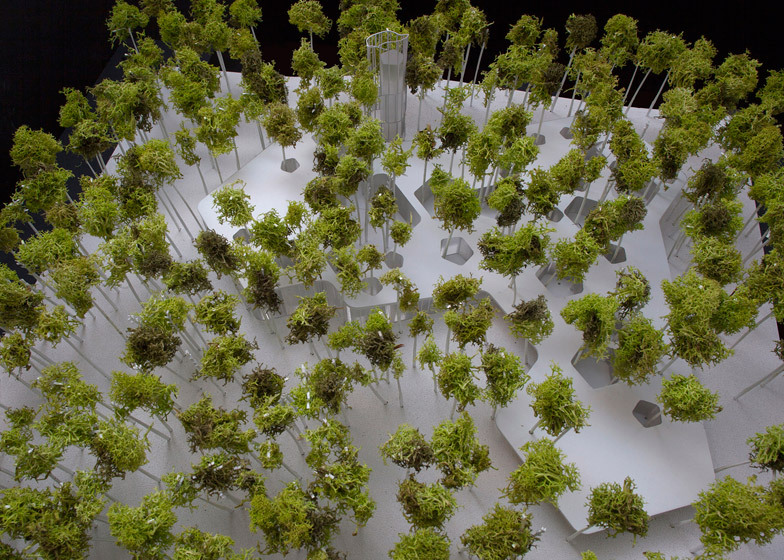 The winner was selected by a jury that included Japanese architect Sou Fujimoto and Arvo Pärt's son Michael Pärt, who described the project as "architecturally fresh". "Tabula creates a harmonious and flexible environment for Arvo Pärt’s music. What deserves to be singled out in particular about this contest entry is its spatial arrangement and thoroughly considered thematic lighting," he said. We admire the purity of the mathematical laws through which Arvo Pärt is capable of generating powerful poetical emotions by means of the simple permutations of a limited number of sounds. 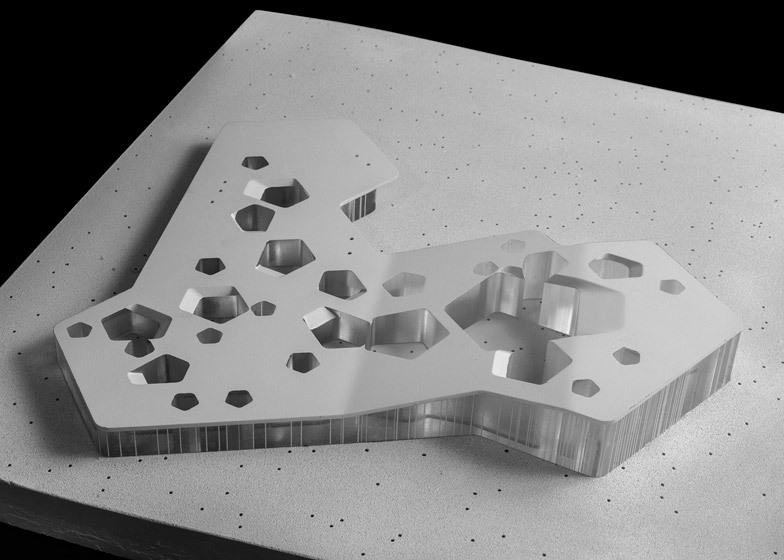 Just like those musical structures that reflect one theme in another – a Spiegel im Spiegel, or a never-ending story – we imagine the new building as a geometric pattern, originated in a repeated pentagonal form, which will contain the existing pines in courtyards of variable dimensions. All the large trees may be preserved: not a single pine shall be teared down. 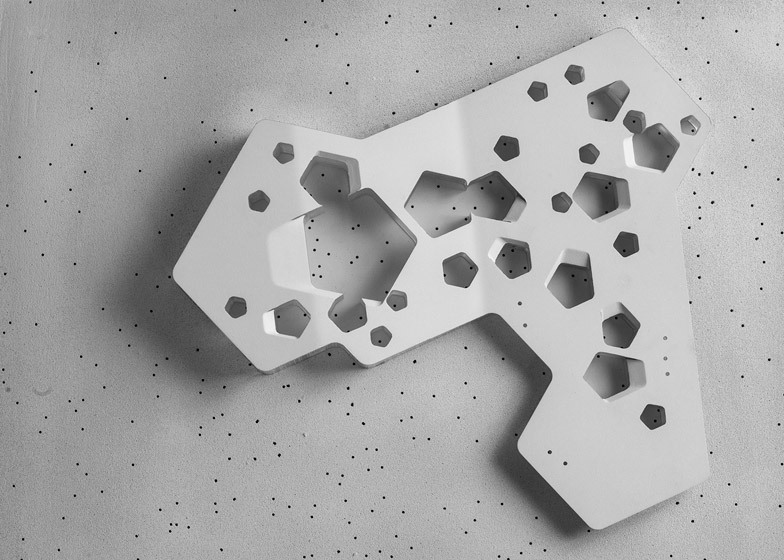 Like a combinatorial composition, the variations of the pentagonal precincts generate spatial sequences that configure the different areas of the program. The interior space is wrapped by two long curved wooden walls that separate the more private areas of the program. The archive and the library are connected to the workshops and to the office rooms on the main ground floor. The auditorium is conceived as a flexible space -a room within a room- for concerts, performances, conferences, and films. The foyer can also be used for exhibitions, and is connected to the shop and cafe in close visual relationship to the exterior landscape. 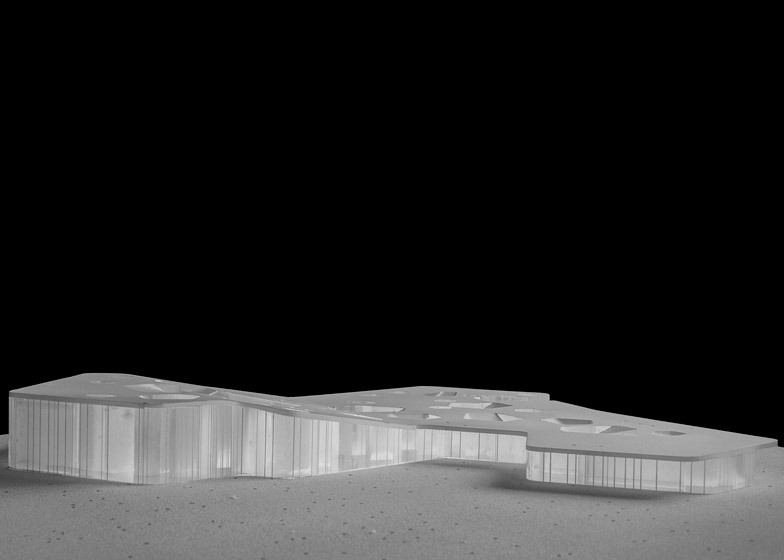 The Arvo Pärt Centre will not be a hyerarchical building: the centre moves from one space to another. It has been conceived as a large single place for concentration and study, in which one can express and exchange ideas, visit an exhibition, go to the cafeteria, read in the library, listen to a performance in the auditorium, or simply stroll out onto the woods. The materials relate to the warm and intimate character of the entire project. In the interior, walls and ceilings of white oiled pine wood, and continuous paved flooring interact with the natural light filtered through the courtyards. A network of electric, digital, audiovisual, and lighting infrastructures ease access to sockets and connections throughout the building. On the exterior, a single element unifies the architectural proposal: a new roof conceived as a large platform, which rises and folds to adapt to the different interior required heights. This roof landscape – clad in precise matte marine aluminium panels – establishes a dialogue between its geometry and the organic shapes of the surrounding trees. The facades are conceived as a filter defined by a changing sequence of slender columns, a free architectural representation of Arvo Pärt's compositions. Some areas will allow larger transparent glass surfaces, whereas others will be more protected, filling the gaps of the filter-like screen. The observation tower is a sculptural light structure which takes as a reference a sequence of Arvo Pärt's Psalms. It has the same pentagonal plan of the courtyards, and is conceived as a helical structure emerging above the trees to allow a distant view toward the sea. To keep alive and interpret in architectural terms the creative legacy of Arvo Pärt means to find a balance between the intimacy of his musical compositions and the powerful beauty of the Estonian landscape. The radical decision of preserving all the pine trees, generates an unexpected dialogue between the unitary structure of the roof and the playful disposition of the courtyard voids. After all, aren't void and silence the hidden protagonists of architecture and music?